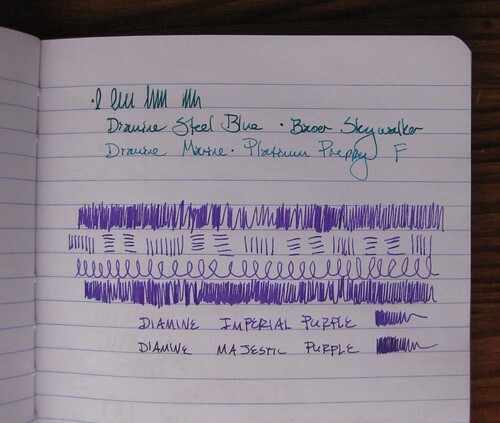 To follow up on that post I did a few days ago on the Diamine inks, here I have photos of them loaded in pens, with the two similar colors next to each other. The Steel Blue definitely looks darker, deeper, and with more jewel-green undertones. 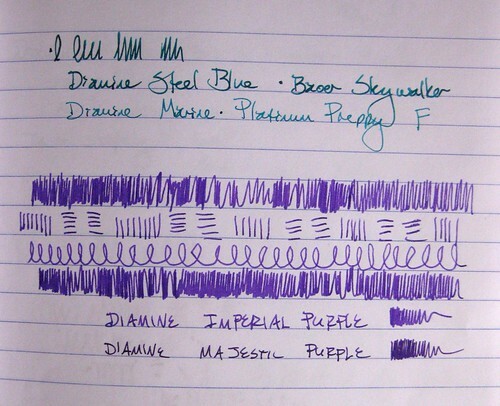 Of the purples, all the scribbles are with Imperial Purple. 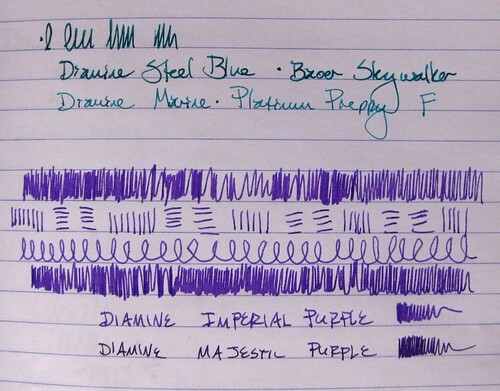 I did not note the pens for those, either, mea culpa: the Imperial Purple is in a Lamy Vista F, and the Majestic Purple is in an Esterbrook SJ with a 2550 nib. Yep, they're similar colors! I do like the Majestic Purple, but whenever I see it next to the Imperial Purple, I like the Imperial Purple a lot more. Yes, I do a little bit of levels/color correction in my photos; just for comparison, the above photo is unedited/corrected for light and shading. Ah, now I prefer the Steel Blue over the Marine!! I can see why making a decision would be so difficult! The Easter sale at Diamine Inks, convinced me to order four of the 30 ml bottles to ship to USA. I picked, a teal, deep blue, blue-black, and a purple. Four small bottles, plus some extra mixes(? ), and shipping for $20 US. Not bad! On Sale up to April 6. 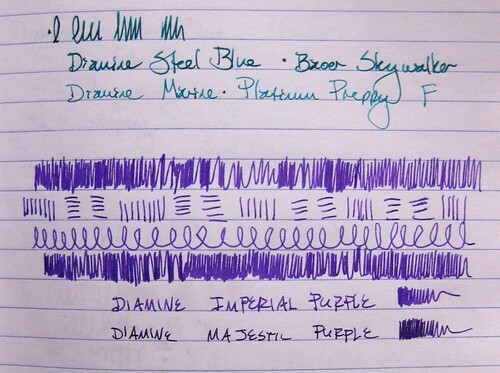 Saw the note about the Diamine ink sale on FPN. This ink enabling thing runs in the family. My Dad just gave me his bottles of P.R. Tanzanite ( purple), and P.R. American blue because the local pen repair guru lady said the Private Reserve ink can gum up the expensive pens. I told him I would love to have the P.R. ink and my cheapo pens do not mind a little gumming. Mixed them together tonight to make "American Blue Violet". P.S. Box of dumpster mailish treasures off to you this week. RLDZ - thanks! I've never written a secret-code letter yet, but perhaps that lurks in my future. MM....You can always keep me in mind, when dumping unwanted inks! Maybe you should have a give-away contest? Carroll - re: giveaway, I'm planning on it! A follow up on my earlier comment - my inks from Diamine arrived yesterday - free shipping within the UK and a free gift of some different coloured cartridges too. I've tried the inks out and am really pleased with them - thanks so much for your recommendation. Glad you like your inks, erasercarver! Isn't it neat how Diamine often gives away free cartridges?